Our digital signage player is simply a Windows App. With it, and any web browser where you set up your digital signs, you can be enjoying Digital Signage in your business using your own PC as the player – in a matter of minutes. With a flat-screen TV and UMix, you can easily create and deploy beautiful digital signs to one or more locations – right from your office using the web. Have your customers viewing your media files in a matter of minutes. It’s as easy as posting pictures on Facebook. Just upload your own images and videos to folders we provide on our secure website. Later you’ll use those assets to make slideshows inside your digital signage presentations. We support a variety of common image and video formats, e.g. – jpeg, mp4, and mov. Customize how you want your presentations to appear by selecting one of our friendly templates. We offer dozens of digital signage templates to give you a variety of options for great screen layouts. For example, you can place scrolling text on the top or bottom and add other elements (widgets) as you wish around your main screen area. Select from among our widgets: weather, clock, current song playing, countdown counter, RSS feeds, still images and even Google Calendar. Widgets help to make your unique digital signage presentation beautifully eye-catching and informative to your customers. 1. 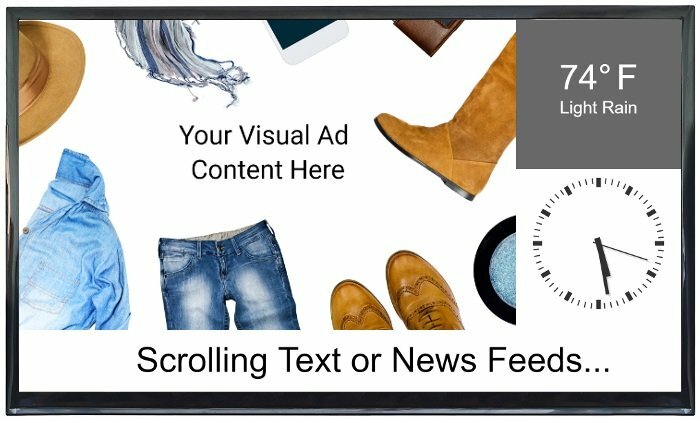 A few seconds before your video ad, the background music in your store fades out. 2. Then your video plays with its accompanying audio. 3. Lastly, the music fades back in. This approach gently draws your customers attention to your video advertising messages.